Rinse, hull and quarter your strawberries. Place them in a medium bowl and sprinkle with ¼ cup granulated sugar, the juice of half of a lime, and ½ teaspoon almond extract. Stir to combine; set aside. While the berries are macerating, make your whipped cream: combine 2 cups heavy cream, 2 cups powdered sugar, and 1 tablespoon almond extract in the bowl of a stand mixer. Beat until stiff peaks form. Line a 9x5 bread pan with saran wrap. Layer one-third of the whipped cream into the bottom of the pan, spreading out evenly. Sprinkle half of the coconut on top of the whipped cream. Top with one-half of your strawberries (along with the juice). Top with a layer of graham crackers. Repeat, adding another one-third of the whipped cream, the remaining coconut, and the remaining strawberries/juice. Top with the remaining graham crackers. Cover and freeze for about 2 hours. Place the remaining one-third whipped cream into the refrigerator while the cake is freezing. After two hours, remove pan from freezer and invert onto a serving plate. 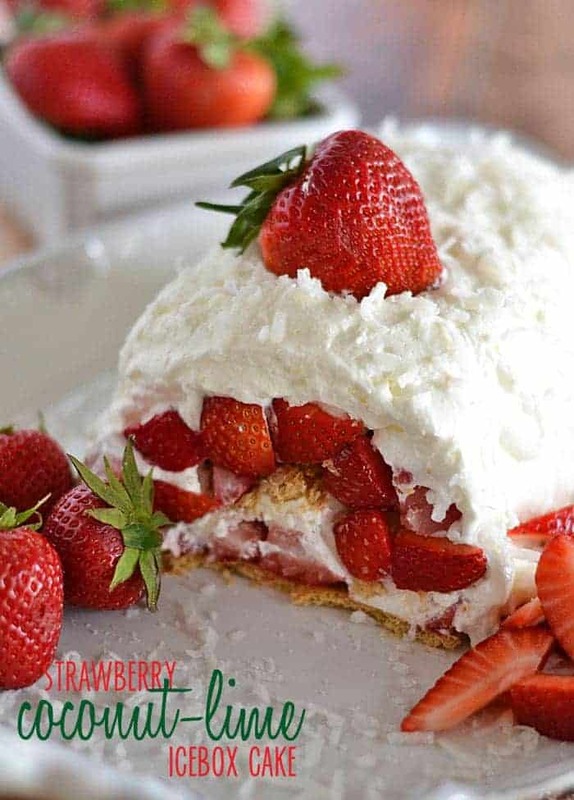 Cover with remaining whipped cream. Refrigerate until ready to serve.